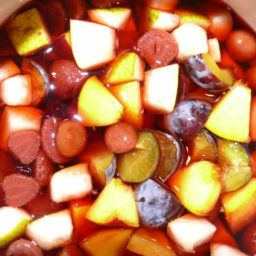 A traditional German dessert made by maturing fruit, sugar, and rum together in a pot between harvest and Christmas. In early summer, prepare a large-mouthed jar and set it aside in a cold and dark place. Harvest ripe fruit and add it in layers to the container, alternating between fruit, sugar (1/2 weight of fruit), and enough dark rum to keep the fruit fully submerged. Retain the mouth of the jar covered with plastic and screw the lid on over the plastic - this helps to prevent evaporation of the alcohol. Wait a couple of months (or more). Eat over ice cream, waffles, cheesecake! Cherries, plums, and berries are my family's favorite Rumtopf fruit. Try to use fruit that is ripe (high in sugar) but still firm; overripe fruit tends to disintegrate after months of soaking in rum (although it tastes great regardless).